In a medium bowl, add the chicken, lime juice, chili powder, garlic powder, cumin, salt and pepper, and let it marinate while you cook the vegetables. In a large skillet, heat 1 tablespoon of the oil on Medium heat. 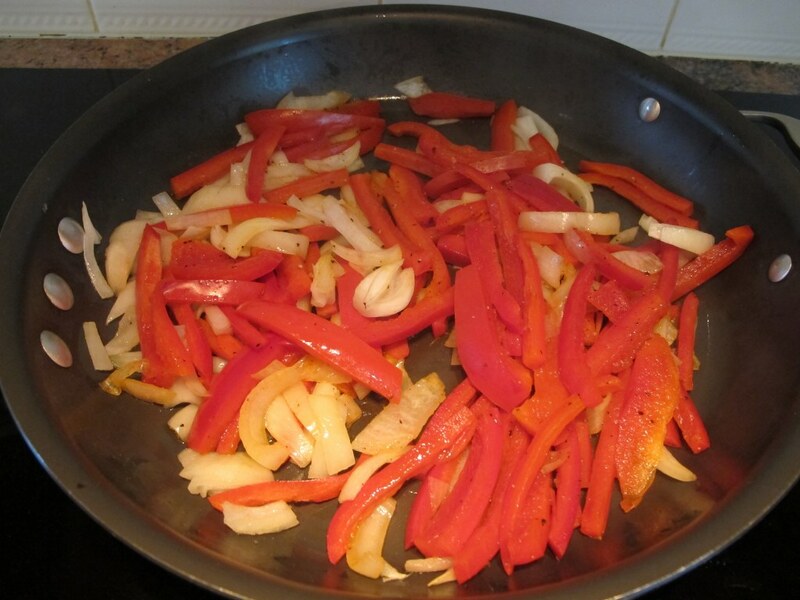 Add the red bell pepper and onion. Stir together, cover with a lid, and cook for about 15 to 20 minutes or until they are tender. Once the vegetables are done, remove them from the skillet. Add the other 1 tablespoon of oil to the skillet on Medium heat. Add the chicken and cook until done. Once the chicken is cooked, add the vegetables back into the skillet and mix until combined. The lighting by my stove isn’t great but I wanted you to see what the veggies look like only after a few minutes of cooking. I like to cover them with a lid while they cook because the steam being trapped helps make them nice and tender. I cooked the chicken in the same pan, after the veggies were done, because I didn’t feel like washing two pans. The entire meal only takes about 30 minutes to make so it’s perfect for a week night. If you cook the chicken and veggies at the same time then it will be even quicker to make! Mmm, so tasty and healthy! 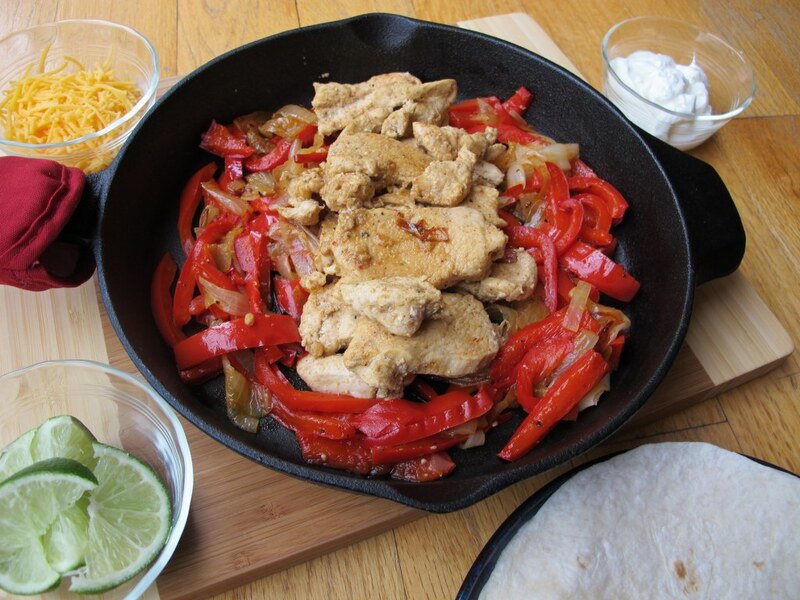 You could make it even more healthy by skipping the tortillas and placing the chicken fajita mixture over a bed of lettuce. That’s just as yummy. 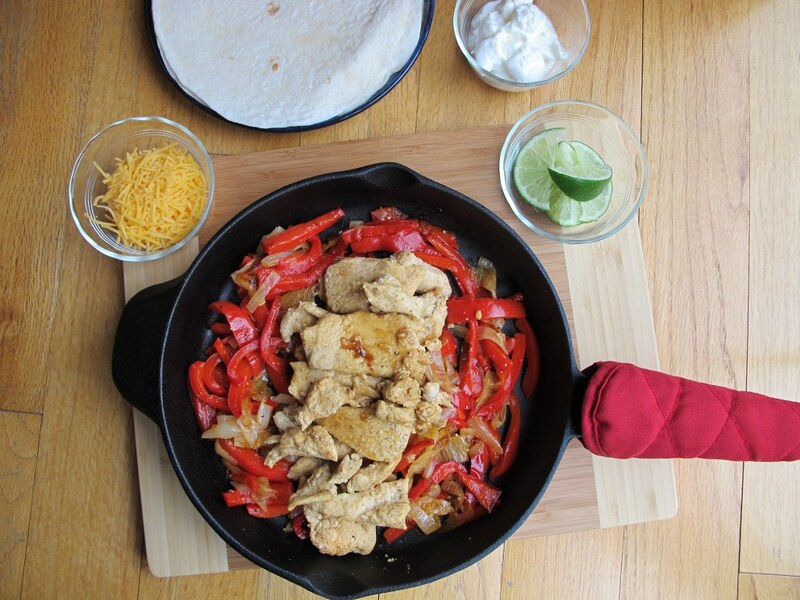 How do you like your chicken fajitas? This looks delicious. A great way to use some onions from the garden too. Putting this on the list to make next week for dinner – thanks! Very cool! Tomatoes and now onions…sounds like an amazing garden! Yum…you just had me drooling over this dish with the explanation of the sound when it comes to the table…makes me want this right now! Hope you are having a awesome weekend! Hehe. Awesome to hear. 🙂 My hubby and I actually had a wonderful long weekend away in VT…nice to get away from reality sometimes. Thanks for asking. 🙂 I hope you had a lovely weekend!